Plant for the Planet is a worldwide tree-planting project initiated by the United Nations Environment Programme in 2006. Individuals, communities, businesses, organizations and governments are encouraged to participate in a global campaign advocating the planting of trees that are appropriate to the local environment. Initially, a billion new trees were to be planted around the world. But at the end of the period, the number of the trees planted had already so far exceeded this figure that the project was extended and a new goal was set. The project was so successful that by the end of 2009, more than 7.4 billion trees had been planted by participants in 170 countries. However, the campaign has yet again exceeded all expectations and boasts more than 10 billion trees planted in 185 countries. With this continuing success, the final target has been increased to 13 billion by the end of 2010. It is rare that a simple act can be so effective as to prompt such a collective, powerful response among communities and governments around the world. What helped galvanize such a massive response could be both a healthy spirit of competition and a simple need to do something for the planet. The campaign has become an inspirational movement and a significant force for taking positive action and playing a vital role in sustaining life on Earth. Until recently, the name of Iran was missing from the list of the countries participating in the project. 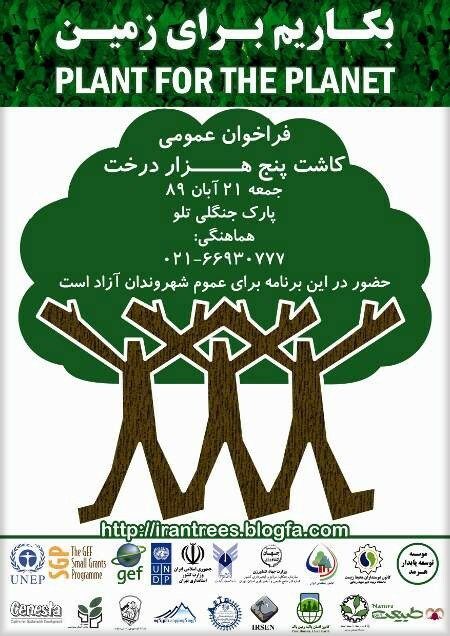 But this was finally remedied, mainly thanks to the efforts of the Nature Association in Tehran which spread the word through nature clubs and email contact. It also got in touch with official bodies such as the Forestry Organisation and the Natural Resources to ask for the provision of saplings. Contacts were also made by the secretariat of the Plant for the Planet project with the relevant official organizations to seek their support. These, together with the cooperation of environmental NGOs, university associations, and ordinary citizens, resulted in a gathering of 300 highly motivated people in the south-eastern outskirts of Tehran. Their target was to plant 5000 trees, but at the end of the day the figure reached 8000! In this multimedia report, we join these volunteers who have shown their dedication to their own local environment as well as their belief in the need for everyone to play an active role in helping to save the planet. We watch them at work in the hills around Tehran and hear their views on the significance of this campaign.